He may be a relatively unknown illusionist, but you could hardly describe Dynamo as being wet behind the ears. And the magician, whose real name is Steve Frayne, certainly proved this was the case as he 'walked' across the River Thames. The nifty footwork was a suitably jaw-dropping publicity stunt for his new TV series. 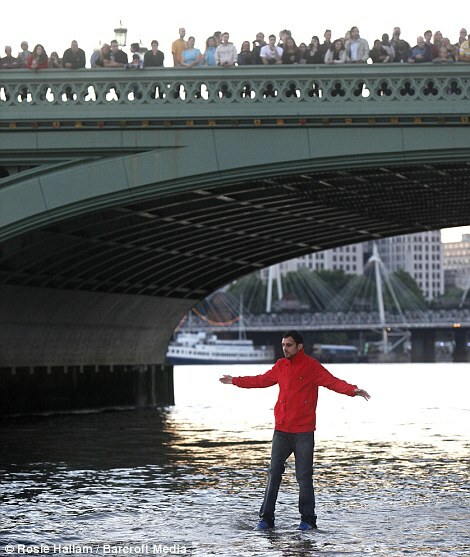 The Bradford-born illusionist, 28, made it half way across the stretch of the river in front of the Houses of Parliament in London before he was picked up by what appeared to be a River Police boat. Tu as vu quelle vidéo ?